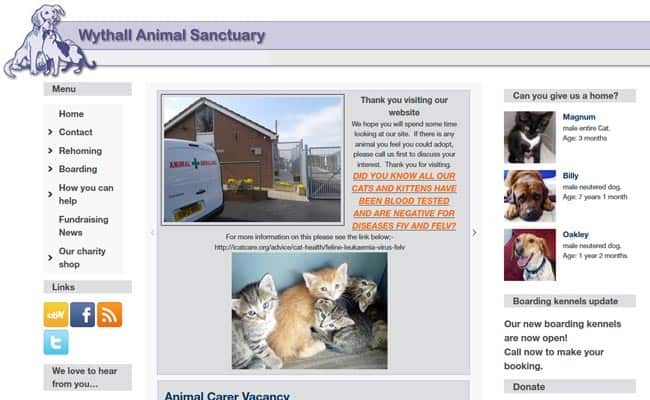 Wythall Animal Sanctuary was founded in 1968, it is located just South of Birmingham rescues and rehomes unwanted pets, in many cases for animals that might otherwise have been destroyed. The sanctuary rehomes cats, dogs, rabbits, guinea pigs, ponies and other small animals and birds. Any animals unsuitable to be rehomed due to illness or behavioural issues will live the rest of their lives in comfort at the sanctuary. The sanctuary also admits and cares for smaller species of wildlife. It is a registered charity solely relying on donations from the public to continue it vital work. The Sanctuary usually re-homes within a 15 mile radius - This is because we carry out all of our home checks ourselves and staff and carers need to complete the home visit and be able to return to complete their other duties. Exceptions can be made in special cases but this is at the discretion of the manager. For visiting the animals 2-4pm everyday except Tuesdays, Christmas, Boxing and New Years Day.